Experience a two-night cruise to Guernsey on our magnificent new ship Spirit of Discovery prior to her maiden voyage. On arrival on board Spirit of Discovery at Dover Cruise Terminal, guests will be shown to their cabins. Once you’ve settled in, afternoon tea will be available in the Grand Dining Room and The Grill. You can then look forward to a superb sail-away party early evening, followed by dinner and a variety of top-quality entertainment. The ship arrives at St Peter Port, Guernsey at approximately 8am on 8 July where guests can spend the day at their leisure. The evening will start with a cocktail party followed by a gala dinner and a variety of entertainment across a number of venues. Spirit of Discovery features the high-end design ethos, cuisine and the top levels of service you would expect in the world’s best boutique hotels. With cuisine styles from all over the world, the new luxury liner boasts our widest-ever selection of restaurants on a par with London’s finest, from the glamour of the Grand Dining Room to oriental and seafood eateries. Spirit of Discovery also offers plenty of space for relaxation, including two pools, a theatre and a sumptuous spa, plus the delights of a secret terrace. The spacious cabins have a real wow factor, too. Each has a balcony, giving guests their own private space, inside and out. Five twin cabins (for up to 10 guests in total) are up for grabs for lucky winners of this two-night all-inclusive cruise sailing from Dover to Guernsey and back on 7-9 July, on board our new ship Spirit of Discovery. Embark at 1pm on Sunday 7 July 2019 at Dover for a cruise to Guernsey. Disembark at 8am on Tuesday 9 July 2019 at Dover on return from Guernsey. All meals and drinks on board. Two nights’ twin cabin accommodation. Please note, the winner of this event is required to be over 50 years of age and chosen guest over 40 years of age. Dover Cruise Terminal, Western Docks, Dover, Kent, CT17 9DQ. Please note, this ballot excludes members from Northern Ireland. Once the ballot has closed and the winners have been drawn, they will be notified by email or phone to confirm they can attend. Winners will be given all the necessary information about the event and how to confirm attendance. Tickets are non-exchangeable and non-refundable, and cannot be transferred to someone else. This ballot prize include tickets and accommodation only. No travel is provided unless stated. Winners will be notified within 24 hours of the ballot closing; please double check your spam/junk mail boxes as we wouldn't want you to miss out! 1. The ballot is open to all activated and eligible Possibilities’ members (“Members”), except employees of the Promoter or any third party directly associated with administration of the ballot. This ballot excludes members from Northern Ireland. Please note that for this balloted event the winner/member must be over the age of 50 and guest must be 40 years of age or over. 3. All entries must be submitted via www.saga.co.uk/membership. Only one entry per Member is permitted. 4. No Member can win more than one ballot in any given 90-day period. In the event a Member is drawn out of the ballot on more than one occasion within such period, that Member’s entry will be disregarded, and the Promoter will be entitled to select another winner in accordance with the process described below. 5. The opening date for entries is 11am on Thursday 11 April. The closing date of the ballot is on 9am on Thursday 25 April 2019. Entries received after this time will not be counted. 7. A winner will be chosen by random draw supervised by an independent person on Friday 26 April 2019. ("Draw Date"). 8. 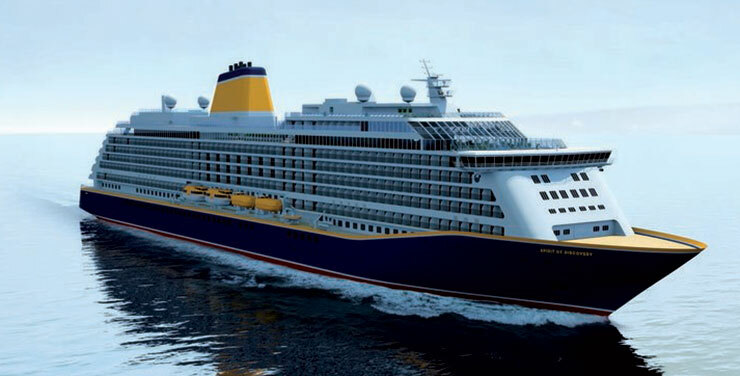 The winner will receive a two-night all-inclusive cruise sailing from Dover to Guernsey and back on 7-9 July, aboard our new ship Spirit of Discovery staying in a twin cabin. All meals and drinks onboard are included. Winner and guest will receive tickets to all on-board entertainment, sail-away party, cocktail party, as well as afternoon tea. Both passengers must have a current EU passport (6 months remaining) and a permanent UK address. All passengers must be adequately insured, optional travel insurance is not included. Non-transferable, cannot be sold or exchanged for cash and is subject to Saga’s standard booking conditions. 9. The winner will be notified by email or telephone (using details provided when activating their membership) before midnight Monday 29 April 2019. If a winner does not respond to the Promoter within 24 hours of being notified by the Promoter, then the winner's prize will be forfeited and the Promoter will be entitled to select another winner in accordance with the process described above. 10. The prize will be sent to the winner by post or email (using details provided when activating their membership). 11. The prize for the winner is non-exchangeable, non-transferable and no cash alternative is offered. 12. The prize is supplied by Saga Cruise Limited. The Promoter reserves the right to replace the prize with an alternative prize of equal or higher value if circumstances beyond the Promoter’s control make it necessary to do so. 13. The decision of the Promoter regarding any aspect of the ballot is final and binding and no correspondence will be entered into about it. 14. The winners’ names and county can be obtained by sending a stamped addressed envelope to Saga Possibilities Event Team, Saga Membership Limited, Enbrook Park, Sandgate, Folkestone, Kent, CT20 3SE, or alternatively by sending an email to eventsinfo@saga.co.uk within 15 working days of the Draw Date. 18. Winners may be required to participate in publicity related to the ballot which may include the publication of their name and photograph in any media. 20. The ballot will be governed by English law and entrants to the ballot submit to the jurisdiction of the English courts. 21. The Promoter of this ballot is Saga Membership Limited of Enbrook Park, Sandgate, Folkestone, Kent, CT20 3SE.